We’re delighted to have won a top insurance award for our consistently high levels of customer service and satisfaction. We collected the Customer Service Award at the 2018 UK Broker Awards – the leading platform for national recognition within the insurance broker sector. Judges said Caravan Guard was always to looking to improve and had the desire to provide genuine customer service. Our Managing Director, Ryan Wilby, said he was absolutely thrilled the company had been recognised in the industry for delivering excellent customer service and satisfaction. “Brilliant customer experiences is one of our company values and our whole team is absolutely passionate about delivering exceptional service to all of our caravan and motorhome customers,” he said. “It’s fantastic to have everyone’s efforts and excellence recognised with this accolade and we thank all those customers who take the time to rate our service. The Caravan Guard team also made the shortlist for the Claims Team Awards, Schemes Broker of the Year and Insurance Broker of the Year. 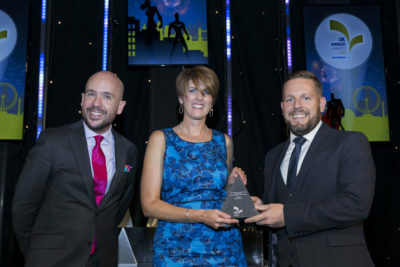 Whilst we didn’t win it was a fantastic achievement for our customer-focused Claims Liaison Team and growth in the caravan and motorhome insurance market to be recognised. Click to find out more about our Defaqto 5 Star rated caravan insurance or great value, highly-rated motorhome insurance. Had to make a claim for an awning damaged by high wind. Sent photos and claim approved within hours for an equitable amount. Fantastic service by Denise at RSA. Thanks for the great feedback Brian. We’ll pass on to RSA.